This is just who I am, take it or leave it. If you're going to be anything in this world, be authentic. Here's the thing: there is no Biblical command for authenticity. There *is* language in Scripture about living in the truth, speaking the truth in love, confessing one's sins, and bearing one another's burdens. There is the language of sincerity, most directly in the phrase, "love must be sincere" (Romans 12:9). But I can't find an explicit command in Scripture for "being real" or "be authentic." Looking at various translations, the word doesn't even appear once in the Bible in the NIV, ESV, NASB, or NLT. It does show up three times in The Message, most notably in Philippians 4:8, which replaces the word "pure" as "authentic" in the paraphrase. I've noticed authenticity can become an excuse for being broken and sinful. This is using authenticity as a crutch, citing the reasoning of "I'm just being real" for unhealthy behavior. There is little sense of a repentant heart or having healthy boundaries with one's emotions. This sort of authenticity can cause all sorts of problems, because while God does call us to live in the truth, there is also a place for healthy boundaries, emotional self-awareness, and recognizing when a relationship or a community is safe to express one's authentic self. There's also a danger in over-sharing, placing our reputations and our hearts into the hands of strangers, who may use or abuse use due our lack of social boundaries. I wonder if it's a generational thing. I've seen this in an approach to social media, where many of the baby boomers I know just don't get why their millennial children are sharing pictures of their dinner or embarrassing self portraits on the Internet. The older generation--or those older in spirit-- talk about not wanting to "air their dirty laundry" with others. They are guarded about their own struggles and doubts and failures, highly aware of social propriety and not wanting to make a fuss. Yet I wonder if they also quietly struggle with deep shame and brokenness, which often spills out into everyday life in (noticeable) poor habits or fears. A lack of authenticity negates relational trust. You can't trust someone who won't be vulnerable with you; and you won't be vulnerable with someone you can't trust. On the other hand, millennials and the younger generation (moniker TBD) seem eager and ready to share everything they can with everyone, ugliness and all. Their meals, their relational mishaps, their mistakes, their triumphs, their opinions--it's all recorded and shared via social media. They're confused when the employer doesn't hire them due to the Facebook profile pictures, or when someone is genuinely concerned or offended when they seem to be making unhealthy life choices. "I'm just being myself. You can't judge me," they say. Yet there is wisdom in having boundaries and recognizing when I've over-shared. I've had people emotionally vomit on me--or on the Internet--with their problems and issues that should have been handled in a more private setting. Too much authenticity also negates relational trust. It rushes a relationship far past its present capacity, and it creates an anxiety about whether or not the overly-authentic person will over-share or over-step their relational boundaries. On one end of the spectrum is being vulnerable. This is an open posture, where a person can be honest about brokenness and joy with sincerity of heart. It's being real, especially about one's failures and struggles and shame. It's bringing oneself out of the darkness into the light. On the other end of the spectrum is being guarded. This is a reserved posture, having healthy boundaries where one has a clear sense of who they can trust with their heart. It's being cautious and discerning, guarding one's heart with wisdom and choosing relationships that are marked by sincerity and grace. Vulnerability and guardedness aren't necessarily opposites, but I do think they create a natural tension. It's rather difficult to be vulnerable and guarded in the same moment. Yet both are necessary to foster trust in relationships, and doing too much of one or the other can break that trust. So what does healthy, holistic authenticity look like? Can we be both guarded and vulnerable, both open and closed? The perfect model for authenticity is Jesus (of course). He was his true self everywhere he went, uncaring about social propriety or what others would say, while still very culturally aware. He was remarkably approachable. He was vulnerable and honest, open about his pains and doubts in Gethsemane while also clear about his mission and declaration of the good news of the kingdom. While vulnerable, he was also guarded, taking time to be secluded and alone, not driven by the crowds' needs or desires, but able to stay focused on his mission at hand while finding all worth through abiding in the Father. When I look to Jesus and abide in him, I can learn to be my fullest, truest self in every part of my life, living in freedom from shame or social anxiety. Perhaps this is the secret to Christ-like authenticity--a constant abiding in God and a life motivated by mission. When I can find my whole worth and vocation outside of myself, recognizing identity as a gift to receive (rather than a persona I must form and create ex nihilo), I am free to be vulnerable, wise to be guarded, and healthy in practicing authenticity. 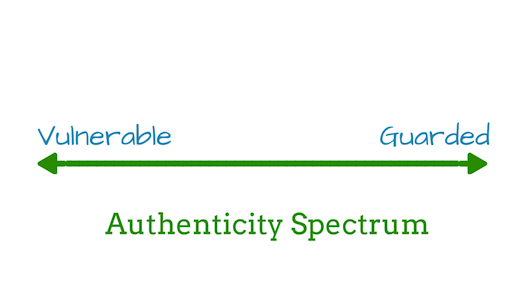 Where do you find yourself on the authenticity spectrum? Why are you drawn towards one side or the other?